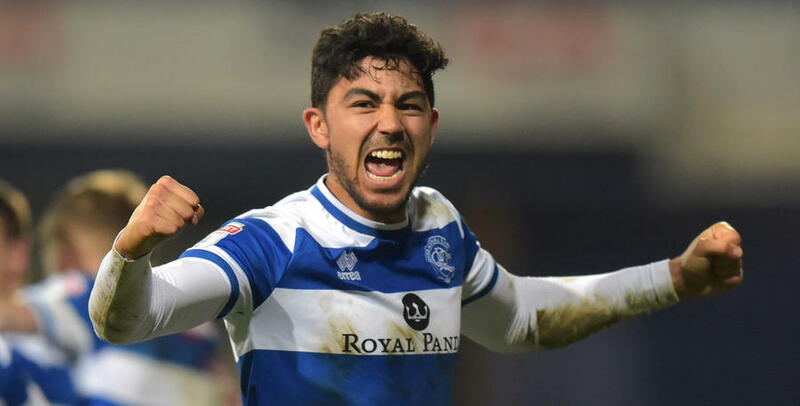 MASSIMO Luongo’s 87th-minute effort earned Rangers a deserved share of the spoils at Loftus Road. 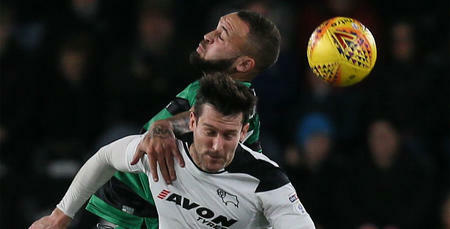 The Hoops initially trailed when Andreas Weimann gave promotion-chasing Derby County the lead shortly before half-time. 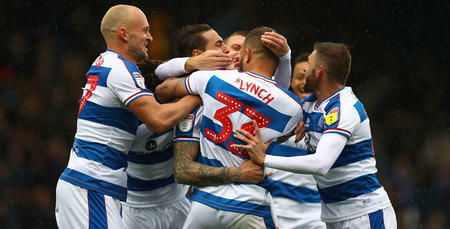 But a draw was a fairer reflection of this encounter – QPR duly levelling matters three minutes from time when Luongo headed in Luke Freeman’s left-flank free-kick. With his side finally back in action after the postponement of Saturday’s fixture at Aston Villa, R’s boss Ian Holloway made two changes to the team beaten heavily at home by Nottingham Forest 10 days ago. Darnell Furlong and Conor Washington were drafted into QPR’s starting XI – at the expense of Joel Lynch and Pawel Wszolek, who dropped down to the substitutes’ bench. Rangers also lined up in a changed 4-3-3 formation: Alex Smithies; Furlong, Nedum Onuoha (captain), Jack Robinson, Jake Bidwell; Josh Scowen, Luongo, Freeman; Washington, Matt Smith, Paul Smyth. The first 10 minutes of this contest made for an untidy affair, though Holloway’s charges did go close in the sixth minute. Smith’s looping edge-of-the-box shot had Derby ‘keeper Scott Carson beaten – but the ball landed on top of the crossbar and bounced over. Derby’s maiden attempt arrived five minutes later. Weimann’s lovely ball over the top of the R’s defence picked out David Nugent who, on the stretch, poked an effort past the foot of the right-hand post from 10 yards. The visitors were then forced into an early sub in the 14th minute, when Joe Ledley looked to have twisted his ankle. Bradley Johnson deputised for the Rams. Rangers started the game well enough, with Onuoha spurning a decent opportunity to open the scoring in the 17th minute. Furlong’s long throw from the right was eventually controlled well by the skipper on six yards. But he snatched at his subsequent shot, which sailed handsomely over. QPR continued to ask questions after that. On the half-hour mark, Smith’s header from team-mate Smyth’s floated right-wing centre was deflected just beyond the target. Freeman then fired his 18-yard attempt wide from the resultant set-piece. However, it was Derby who would go in for half-time ahead – and it has to be said that their 38th-minute goal came against the run of play. In truth, it was too simple for Kasey Palmer in the build-up, who beat four men with relative ease before slipping in Weimann. The former Aston Villa man then dinked the ball past Smithies from close range, who raced off his line to challenge. A disappointing end to the first period for the R’s, who didn’t exactly deserve to trail. When the second half arrived, it would have been 2-0 to the Rams but for a superb 57th-minute save from Smithies – the Rangers goalkeeper pulling off a point-blank stop to acrobatically deny Curtis Davies, who met Weimann’s pinpoint cross. Holloway responded by making a first home change on the hour mark. Ebere Eze replaced Washington. Five minutes later, QPR had appeals for a penalty turned down when Smith went to ground under challenge in the box, before Eze’s low drive from range was collected by Derby’s Carson at the second attempt. The R’s went even closer in the search for an equaliser in the 72nd minute. Freeman’s dipping 25-yard volley was parried by Carson, before Onuoha’s follow-up attempt was blocked. Holloway then made an attacking second sub – Wszolek replacing Furlong. Minus stoppage time, around a quarter of an hour now remained. Could the R’s force a late leveller? Well, Smith went mightily close in the 83rd minute, nodding just wide of the right-hand post from six yards following Wszolek’s hanging centre. Lynch then took the former’s place with four minutes left on the clock. Thankfully, a deserved equaliser would arrive in the 87th minute. Freeman was on hand with his 11th league assist of the season, as his clipped free-kick from the left was powered home by the head of Luongo from six yards. Loftus Road erupted as the R’s drew themselves level – and five minutes of added time at the death offered a grandstand finale. Indeed, Rangers almost snatched a dramatic win deep into injury time when Freeman put sub Lynch through on goal. But Carson stood firm to repel the stand-in striker’s eventual effort. 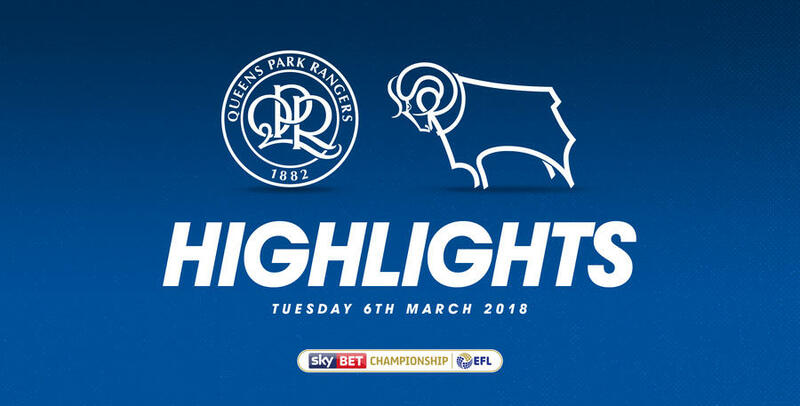 WATCH highlights from QPR's 1-1 draw with Derby County at Loftus Road.